Work where you live! 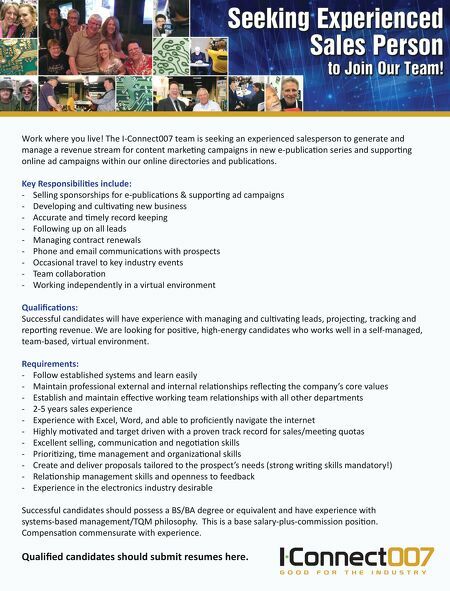 The I-Connect007 team is seeking an experienced salesperson to generate and manage a revenue stream for content marke ng campaigns in new e-publica on series and suppor ng online ad campaigns within our online directories and publica ons. Key Responsibili es include: - Selling sponsorships for e-publica ons & suppor ng ad campaigns - Developing and cul va ng new business - Accurate and mely record keeping - Following up on all leads - Managing contract renewals - Phone and email communica ons with prospects - Occasional travel to key industry events - Team collabora on - Working independently in a virtual environment Qualifica ons: Successful candidates will have experience with managing and cul va ng leads, projec ng, tracking and repor ng revenue. We are looking for posi ve, high-energy candidates who works well in a self-managed, team-based, virtual environment. Requirements: - Follow established systems and learn easily - Maintain professional external and internal rela onships reflec ng the company's core values - Establish and maintain effec ve working team rela onships with all other departments - 2-5 years sales experience - Experience with Excel, Word, and able to proficiently navigate the internet - Highly mo vated and target driven with a proven track record for sales/mee ng quotas - Excellent selling, communica on and nego a on skills - Priori zing, me management and organiza onal skills - Create and deliver proposals tailored to the prospect's needs (strong wri ng skills mandatory!) - Rela onship management skills and openness to feedback - Experience in the electronics industry desirable Successful candidates should possess a BS/BA degree or equivalent and have experience with systems-based management/TQM philosophy. This is a base salary-plus-commission posi on. Compensa on commensurate with experience. Qualified candidates should submit resumes here.